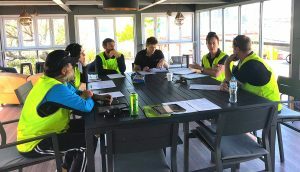 The White Bay 6 and Sydney Harbour Boat Storage teams are constantly keeping their skills up to date through a strategic training program that includes industry based courses and external advisors. Ian Hume from Hume Marine, based at White Bay 6, recently took the time to review the work practice of our team caring for customers’ outboard engines when taking their boats in and out of storage. Hume Marine have been servicing boats on Sydney Harbour for over 17 years and can work with you on warranty work, parts supply, and general maintenance. They offer a mobile service and have extensive experience with all types of marine engines, generators, steering and control systems. The White Bay 6 team were pleased that Ian gave their systems the ‘thumbs up’ and was on hand to answer their questions and give advice.